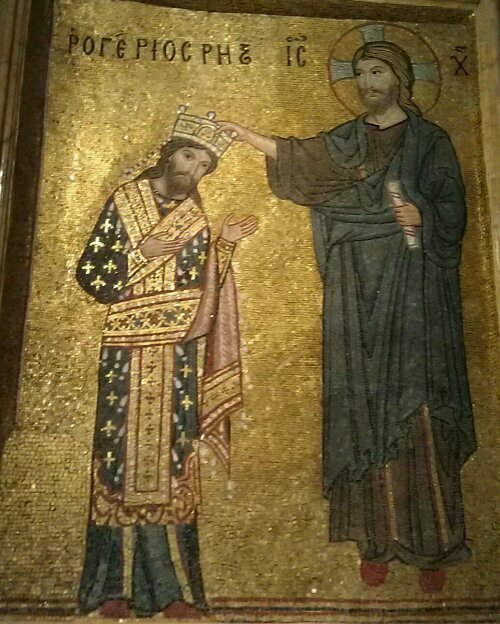 Roger II being crowned King of Sicily by Jesus. The inscription says Rogerios Rex in Greek letters. After reading Sicily: Three Thousand Years of Human History by Sandra Benjamin, I became intrigued with Roger II, who was King of Sicily during the Norman period. The Normans, a people who descended from northern French, Norse, northern German, and Viking tribes, ruled Sicily for most of the 11th and 12th centuries. As Benjamin explains in her book, Sicily’s history is like a barbell–it’s most culturally prolific and economically prosperous periods being the two ends of the weight (Greek and Roman on one end, modern times on the other), with a bump in the middle. This bump, where your hand would hold the barbell, is the Norman period. Roger II was born in Sicily in 1095, and because he grew up in Palermo, he truly wanted the best for his homeland. He was well educated, had an affinity for the arts and sciences, and importantly, had facility with languages. In fact, he made it his business to learn most of the common languages of the day: various Sicilian dialects, Greek, Arab, and Latin. Consequently, he demonstrated and keenly practiced tolerance for Sicily’s multiculturalism. Roger II was a Renaissance Man, before the Renaissance! From the start, Roger worked to improve Sicily’s economy, and a time of great prosperity and peace followed. In Palermo he surrounded himself with the top intellectuals of Sicily’s multicultural population, including Arab geographer Muhammad al-Idrisi, Greek historian Nilus Doxopatrius, and Englishman Thomas Bran, to name a few. Roger incorporated and encouraged inclusion of all of the various cultures, religions, and races that shared Sicily–native Sicilian, Norman, Arab, Byzantine, Greek, Jewish, English, German, and more–into his government. As a result, Sicily thrived, and it became the leader in trade and maritime power in the Mediterranean. In sum, Sicily was the center of East and West. And Palermo was the New York City, London, Dubai, and Singapore of its day. To keep this very simple (Books are written on this topic. ), after many changes in southern Italy’s power structure, by 1139, Roger became king of all of the southern Italian peninsula and Sicily, which included obviously, Sicily, Calabria, Basilicata, Apulia, and Naples (Campania). I won’t get into all of the politics and history of the papal infighting and distrust the Holy Roman Empire’s chief administrators had of the Normans, and especially of Roger and Sicily’s growing strength, but for this post, it is important to realize that there was a serious power-struggle between the Pope and Roger. And at the time, the Pope was supposed to be the authority who confirmed and granted royal power. So, in 1139, when Roger sought confirmation of his title as King of Sicily, Duke of Apulia, and Prince of Capua, the Pope fought to deny him this… and well, eventually, there wasn’t anything the Pope could do. The bottom line: Roger II was a rebel, and not just any rebel. He was a rebel with a cause, and his cause was Sicily, a land that he loved. Definitely a man after my own heart, and certainly, someone I’d like to have dinner with! I have just discovered your site, and I am thrilled! Thanks!